A hidden gem awaits you in the Western Cape region of South Africa. Pringle Bay, a tranquil coastal village, a mere one hour’s drive from Cape Town International Airport is situated between Gordon’s Bay and Hermanus on the prestigious Whale Route Coast, an area renowned for superb land based whale watching. Offering an air of understated intrigue, Pringle Bay and the Kogelberg Biosphere Reserve, a UNESCO World Heritage Site nestles snugly between two of nature’s wonders, the Klein and Groot Hangklip mountains. 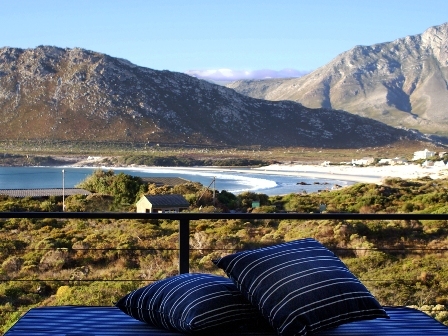 Moonstruck on Pringle Bay, a 4 star, luxury rated contemporary beach house retreat offers private and luxurious oceanfront accommodation with panoramic views to the discerning traveller. The guesthouse is an “idyllic romantic getaway” for enjoying a coastal vacation. The pristine sandy beach is under a 3 minutes stroll through an indigenous “fynbos” greenbelt in front of the house; ensuring our accommodation is perfectly located for a beach vacation. 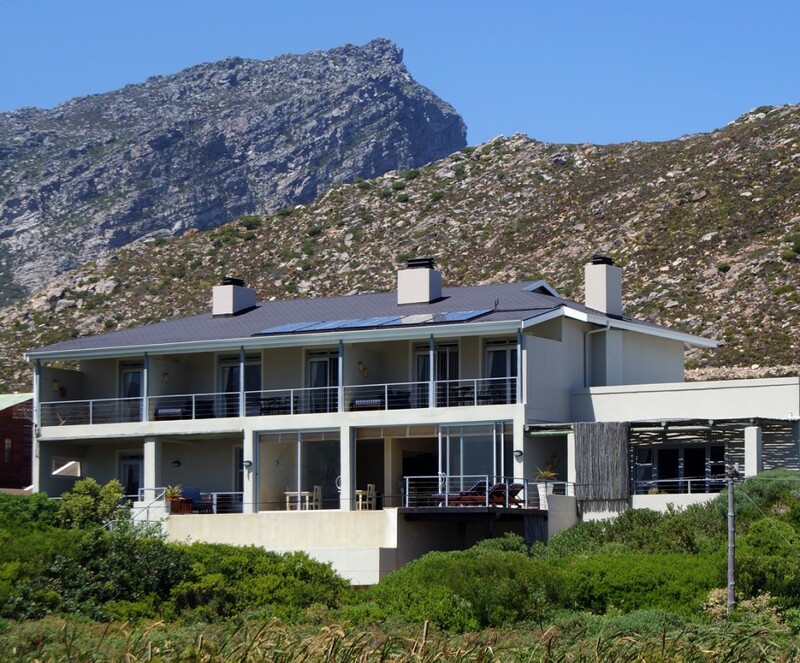 Operating on a bed and breakfast (B&B) basis, guests enjoy gourmet breakfasts whilst enjoying mountain and ocean views, with an array of quality restaurants all within easy strolling distance of Moonstruck. 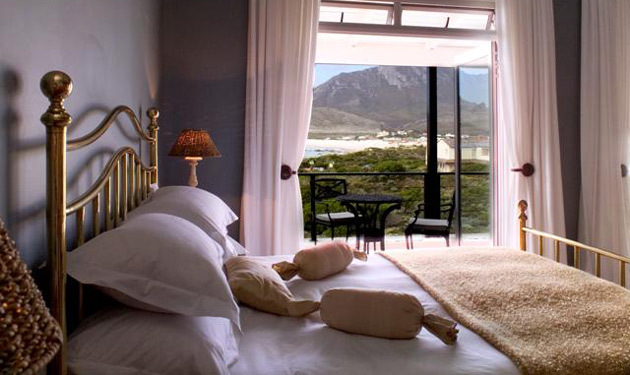 Accommodation consists of 4 private and very spacious rooms, all with spectacular views of the Atlantic Ocean and the Hangklip Mountains; on a clear day you can see Table Mountain and the entire peninsula across False Bay. All rooms have their own shaded private patios, and three of the rooms have their own log fireplaces. All the bathrooms are en-suite with travertine marble tiles, sumptuous baths, separate showers, under floor heating, heated towel rails and a range of aromatherapy products. Needing privacy and luxury? Escape to reality and come and spoil yourself! The house featured in SA Homeowners 2008 April edition for architectural excellence and has been designed specifically to offer luxury and privacy to guests. Furnishings are eclectic creating a sophisticated ambience and our attention to detail ensures that guests comfort is foremost in our mind! Awaken to the call of the Oyster Catchers, jog with the Sand Pipers, sneak up on the shy Cape Clawless Otter; all this before you decide what the day has to offer. The surrounding countryside of the Western Cape region offers a diverse selection of eco-tourism and recreational activities; golf courses, whale watching, wine routes, great white shark cage diving, botanical gardens, a safe swimming beach, surfing, kite boarding, sand boarding, bird watching, a resident penguin colony, hiking and nature trails and the Kleinmond wild horses … to name but a few. 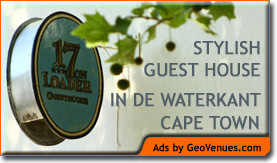 For Guest House Accommodation in Cape Town, visit 17 on Loader, situated in de Waterkant.